Enter for your chance to a win passes for two to a special 3D Advance Screening of PIRATES OF THE CARIBBEAN: DEAD MEN TELL NO TALES at AMC Altamonte Mall 18 - 433 E. Altamonte Drive, Altamonte Springs, FL 32701, on Tuesday May 23rd, 2017 at 7:30PM. © 2017 Disney Enterprises, Inc. Johnny Depp returns to the big screen as the iconic, swashbuckling anti-hero Jack Sparrow in the all-new "Pirates of the Caribbean: Dead Men Tell No Tales." The rip-roaring adventure finds down-on-his-luck Captain Jack feeling the winds of ill-fortune blowing strongly his way when deadly ghost sailors, led by the terrifying Captain Salazar (Javier Bardem), escape from the Devil's Triangle bent on killing every pirate at sea-notably Jack. Jack's only hope of survival lies in the legendary Trident of Poseidon, but to find it he must forge an uneasy alliance with Carina Smyth (Kaya Scodelario), a brilliant and beautiful astronomer, and Henry (Brenton Thwaites), a headstrong young sailor in the Royal Navy. At the helm of the Dying Gull, his pitifully small and shabby ship, Captain Jack seeks not only to reverse his recent spate of ill fortune, but to save his very life from the most formidable and malicious foe he has ever faced. 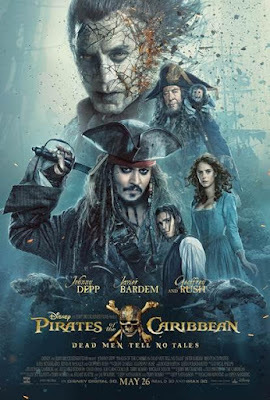 "Pirates of the Caribbean: Dead Men Tell No Tales" also stars Kevin R. McNally as Joshamee Gibbs, Golshifteh Farahani as the sea-witch Shansa, David Wenham as Scarfield, Stephen Graham as Serum, Orlando Bloom as Will Turner, and Geoffrey Rush as Captain Hector Barbossa. Visit Pirates of the Caribbean: Dead Men Tell No Tales on Facebook and Twitter. PIRATES OF THE CARIBBEAN: DEAD MEN TELL NO TALES is in theaters on May 26, 2017. Share, Follow, and Subscribe to Win! Disclaimer: NO PURCHASE NECESSARY. Limit one (1) admit-two pass per person. This film is rated PG-13. Must be 13 years of age or older to win passes. Employees of all promotional partners and their agencies are not eligible. Void where prohibited. Entries must be received by 5/13 to be eligible to receive pass. Winners will be contacted via e-mail to receive their pass. Sponsors not responsible for incomplete, lost, late or misdirected entries or for failure to receive entries due to transmission or technical failures of any kind. SEATING IS LIMITED, SO ARRIVE EARLY. PASS DOES NOT GUARANTEE A SEAT AT THE SCREENING. Refer to screening pass for further restrictions. ONE ENTRY PER PERSON.